We wrote about Melograno in 2010 and thought it would be fun to do an update by giving the Center City restaurant The Nana Test. As a reminder, The Nana Test is our unique way to grade Italian BYOBs. It consists of five elements that best describe meals my Italian family shared at my Nana's house while growing up. Each restaurant is graded according to five criteria and given a score between 1 and 5 (5 being the best). Let’s see how Melograno fared. Atmosphere: The big front windows are inviting if you get a seat near the entrance and the open kitchen is lovely if you’re in the back. We’ve had loud conversation over the years and no one seemed to notice or care. Importantly, there is never a push to rush the meal, which creates a relaxing atmosphere. Great place to eat out with a group of friends or on a date; reservations are recommended, especially after summer ends. Simplicity: Melograno has an appealing mix of dishes ranging from pasta to meat to fish. While a straight pasta with red sauce is not on the menu, you can find amatriciana and cacio e pepe - two simple dishes - alongside more elegant options like sweet potato ravioli or char-grilled quail. One of our favorites is the Pappardelle Al Ragu di Cinghiale, or wild boar pasta. It’s a simple dish usually done well. The sauce: We were excited to try the cacio e pepe to see how Melograno compared to the knockout version at Amis. Sadly, Amis was the Mike Tyson to Melograno’s Glass Joe. No contest. 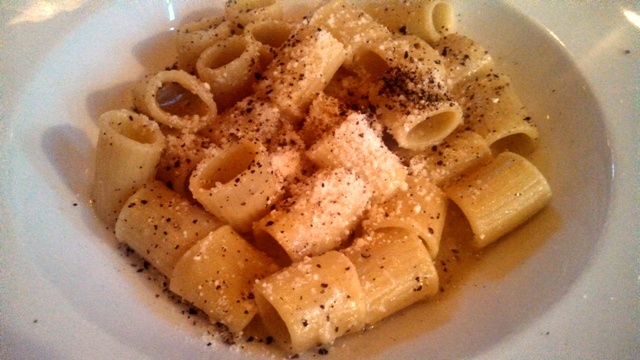 The sauce was too thick and was overloaded with pepper, while the rigatoni lacked flavor and it didn't give off the charm that homemade pasta should. 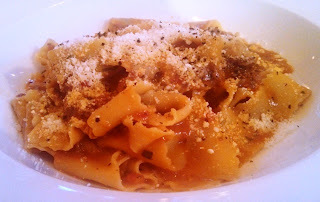 Even our favored wild boar pasta lacked it’s typical punch and was light on the wild boar during this second visit. Maybe it was an off night in the kitchen? On a bright note, the side of green beans served in a garlic butter sauce were incredible. Antipasti: Melograno's traditional antipasti is pricey at $18, but it does consist of a mix of high quality meats and cheeses. 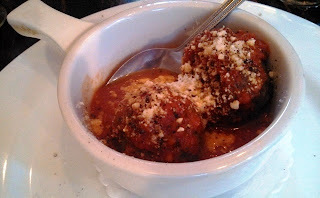 The pork, veal and beef meatballs were fantastic; you get two for $10. The polenta carozza was also excellent. The soft polenta is stuffed with mozzarella, lightly fried and served over a tomato puree and pesto basil sauce. Yum. Serving size and bread: Not too big, not too small is a fair assessment of the serving size, especially for the pastas. At a place like Melograno, we tend to stick with an appetizer and pasta dish each and it's plenty to eat. The secondi options are pricier, averaging more than $25 each. No complaints about the bread or accompanying dipping sauce. Sambuca test: A polite no. Final score: 18 out of 25. For an Italian BYOB that we recommend often (and will continue to do so), this was a lower score than we would have initially expected, but you can't fool The Nana Test.